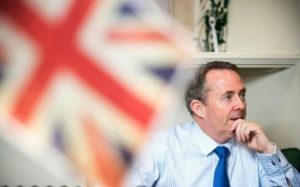 Britain has already begun informal trade negotiations with 12 countries across the world, Liam Fox reveals as he says Brexit is “key to British prosperity”. Writing in The Telegraph, the International Trade Secretary says that Britain is conducting “trade audits” in order to prepare deals that can be announced as soon as the UK quits the European Union in 2019. It is understood that ministers and officials are already in talks with countries including China, India, Australia and South Korea as well as Middle Eastern nations such as Saudi Arabia and Oman. His comment came as David Davis, the Brexit Secretary, confirmed that the Government still pledges to get net migration down to below 100,000, saying that once immigration is “under your control anything is possible”. What sort of trade deals are we talking about? In his article, Dr Fox writes: “When we leave, we will want to develop new arrangements with countries like Australia, New Zealand and India. We are conducting trade audits with a number of countries to see how we can remove barriers to trade and investment to our mutual benefit. One country missing from that list is the USA. Despite Donald Trump’s overtures, the type of trade deal the USA will be prepared to sign will likely be at least as comprehensive as the much-maligned TTIP. This is the president who wants to renegotiate NAFTA, the USA’s trade deal with Canada and Mexico. Will Australia, New Zealand and India be looking for the same sort of deal as the USA? Possibly not. Australia and New Zealand already have their own version of the Single Market anyway, with free movement between the two countries. And the Trans-Pacific Partnership (TPP) deal, similar to TTIP, looks dead in the water, with Australia signaling its interest in a Chinese-led pact instead. Given cultural ties with Australia, New Zealand and India, it’s unsurprising that these are the first countries that the UK government will want to speak to. Next on the list should be Canada and South Korea. Canada should also be on that cultural list, but more relevantly both these countries have free trade agreements in place with the EU. The Canadian agreement (CETA) was only signed last year and the South Korean agreement is still provisional. It really shouldn’t be too difficult to turn these into agreements with the UK. Is this what we want? CETA is, in many ways, similar to TTIP. This means corporations having the legal right to claim compensation from governments who restrict business opportunities. Examples might be ruling against certain food imports on health grounds, or nationalising parts of the economy. In short, increased democracy will come at a cost. I am as wary of TTIP as anyone. I find it hard to trust political leaders who see good in these agreements, and Liam Fox is one such politician. He is an idealist, a Thatcherite in many ways, whose idea of trade meant selling off national assets to private companies, often large global concerns. This flies in the face of the politics of Conservatives (large C) who value the individual, their choices and their social mobility. It would be hard to get a trade deal like TTIP through the UK parliament. Given that Liam Fox might be out on a limb here, and that Brexit is going to happen whether some of us like it or not, trade deals are probably the way to go. But not trade at any cost. The good thing about the EU’s Single Market was that it didn’t discriminate between which goods or services were traded. Everything was in the mix. Trade agreements painfully go through every good and service, stating which are to be free of tariffs. This impacts producers in the respective countries whose goods might or might not be specified. How would sheep farmers in the UK feel about New Zealand lamb being imported free of tariffs? Would they feel better if New Zealand removed tariffs on potatoes? Almost certainly not, even though both economies will, over all, improve as a result. So trade deals always give us winners and losers. The UK fishing industry will probably be pleased to be out the of EU. Financial services less so.